The rise of stitch and knit clubs, guerilla knitting, yarn bombing and calls to knit sweaters for oil-spill affected penguins have all drawn attention to craft as a force for social change. 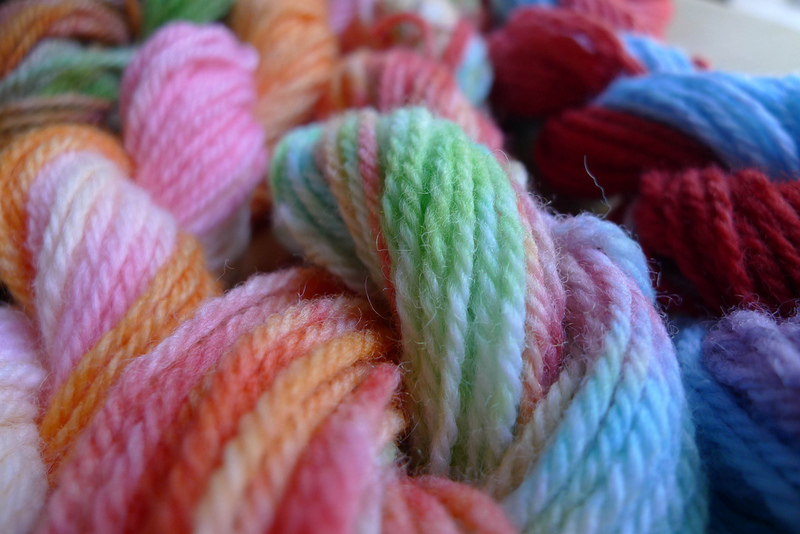 Knitting is mobile, sociable, inexpensive, and now good for our mental health. But knitting for a cause is nothing new, and with the centenary of World War I approaching, it is worth considering the legacy of its mass knitting projects. When outfitters and clothiers ran short of certain garments, relatives of British soldiers were enlisted to knit for the war effort. The resulting gloves, socks, mittens and balaclavas became affectionately known as “comforts”. 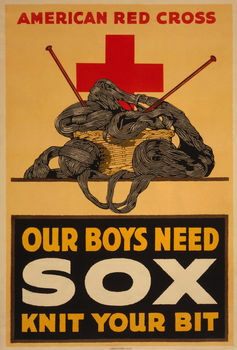 In World War I the volunteer make-up of the British army – the fathers, sons and brothers who went to war – drove the craze for civilian knitting. Garments were to fortify civilian soldiers against harsh winters and a hostile enemy; hand-made knits comforted body and soul on the western front. Of course, women did most, if not all, of the knitting, the subtext of much propaganda being that they were knitting for love. Images of women furiously knitting socks suggested that traditional social structures were reinforced rather than destroyed by conflict. In reality, war reversed gender roles; after all, women were called upon to work in munitions factories and on the land. Images that constructed knitting as a feminine activity distorted that reality. Wartime knitting may have had a feminine image, but it was not timid. What started as a response to small gaps in uniform supply became a mass knitting frenzy, which made government very nervous about the quirky, un-military garments reaching soldiers at the front. The standard analysis of World War I knitting projects points to their conservatism. Paul Ward, for example, argues that home knitting generated patriotism among aristocratic and middle-class women. But official signs of anxiety about over-production and rogue knitters were such that they issued knitting patterns, warning women to narrow the range of garments and to use only khaki wools. I found a wartime knitting pattern in the National Army Museum, instructing women to make regulation garments, among them a knitted balaclava helmet, regulation body belt, knitted mitten, bedsock, knitted sock, knitted muffler and sleeveless jersey. Many of these items were also mentioned in letters and diaries in the Imperial War Museum, such as Tom Thorpe’s correspondence while he was serving as an NCO with the 2nd/9th Battalion Hampshire Regiment. He wrote to his family around Christmas 1914 to thank them for various items of food and clothes and, in particular, his sister for her gift of hand-knitted mittens. He wrote again to Nellie in October 1916: “Thank you very much indeed for knitting me that helmet, it is very nice indeed and exactly what I wanted.” He later died of wounds from the third battle of Ypres in September 1917. Deeply personal objects, made at home and sent to the front, were later to become poignant traces of the dead. Knitters were doing what the army could not: making a creative intervention in a difficult situation. The problem was that the success of mass war knitting projects highlighted army failures. One response was a wartime knitting pattern issued by Lord Kitchener. Sock seams were a problem in the trenches: they rubbed soldiers’ toes until they bled. The Kitchener stitch allowed socks to be finished off smoothly, which made soldiers more comfortable. Civilian craft projects were a model of active concern for soldiers in the field – and when their efforts threatened to expose official shortcomings, the state fought back with craft. Knitters were not necessarily conservative. They sought to bring some humanity to a brutal and unpredictable war. On one hand, the mobility of knitting made it the perfect symbol of civilian enthusiasm for the war effort. On the other, when the passion to knit comforts brimmed over, it threatened to become an anti-establishment protest. The sheer scale of the effort, its anarchic spread nationally and internationally, gave wartime knitting political potential, with parallels in the craftist projects of today. To send something personal, and lovingly homemade, to a relative in real mortal danger, gave knitters the satisfaction of making a direct intervention, but crafting such personal items also meant contemplating fear and loss. This was not what the authorities wanted. Wartime knitting was supposed to be cheerful and optimistic, not dark and ponderous. 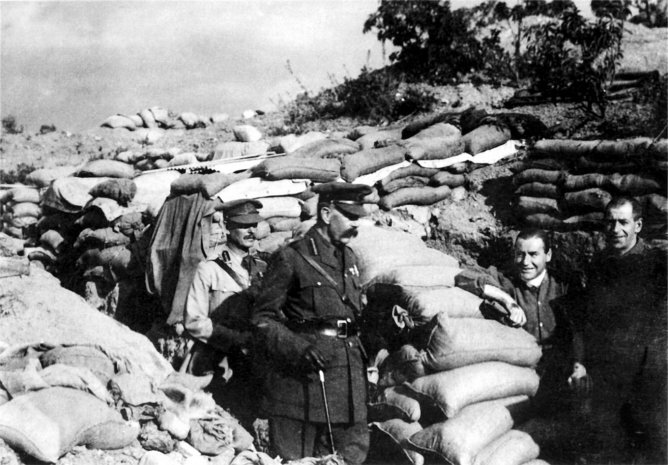 World War I was a step into the unknown – much of the war effort had to be improvised. So knitting was far more than a timid pastime for women on the home front. When these subcultures of creative activity spontaneously erupted, they were healing the damage to communities caused by mass recruitment. Unexpectedly, knitting became a force for good that forged vital bonds between home and battle front. There is nothing new in the impulse to knit for a cause; it appears that volunteer crafters have been making their modest humanitarian efforts for at least a century. This entry was posted in Material Culture, The Memory of War and tagged 677 (Textiles), Blogs, HQ (Family - Marriage - Women - Sexuality), TT (Handicrafts. Arts and crafts). Bookmark the permalink.